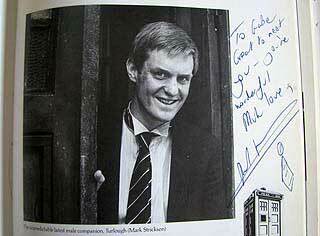 The Madison Jabos' history with the long-running British television show Doctor Who goes back a long way. Day and Gabe were watching every weekend from the time PBS began re-broadcasting the BBC's iconic sci-fi/fantasy drama in America. The show's time-and-space-traveling vehicle is known as the TARDIS, and always appears disguised as a British police box from the 1960s. 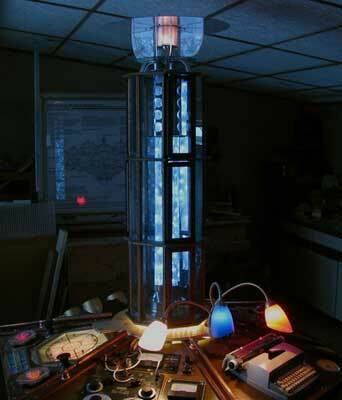 (right) The Dixon Street TARDIS circa 1985, made from discarded doors, blue house paint and a jelly-jar light on top. 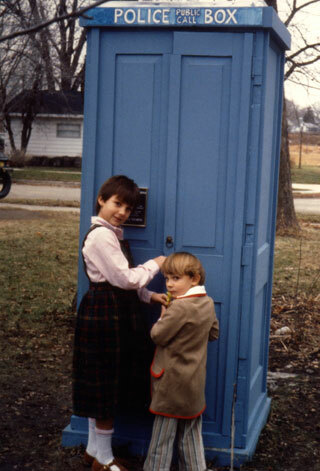 Day (age 7) as Romana with Gabe (age 3-1/2) as The Doctor. Lou/Bill sewed their costumes to resemble the show's two main characters. 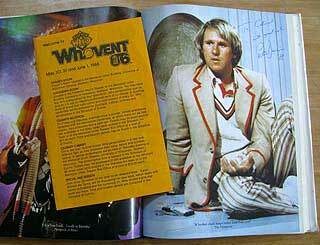 In 1986, Lou/Bill learned of an upcoming Doctor Who event at a Madison hotel, and a chance to meet cast members. We had only a few hours notice; it was too late to get tickets, but we went anyway. Dad shamelessly brought them inside the hotel doors but could go no further. The children would need to climb the stairs and find the hall. 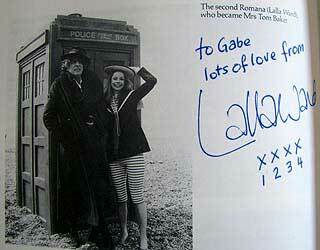 They were in costume; Day carried a camera and Gabe a Doctor Who book. Day protested, "We're just kids. They won't let us in!" Dad replied, "Me, no. But you, dressed like that — trust me, they'll let you in. Because you're kids." Day recalls now some 30 years later what happened. 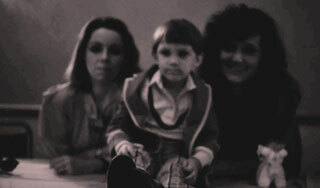 The children found the hall and stood nerviously in the back, being stared at by a roomful of adults. Then some tall skinny guy (who Day as an adult realizes was likely —and flamboyantly— gay) threw up his hands with a huge smile, exclaimed "Oh My God!" and snatched Gabe away to the front table. Day stayed rooted, back plastered to the wall, with the only thought in her head: "They've taken him. They've taken my brother. Now what do I do?" 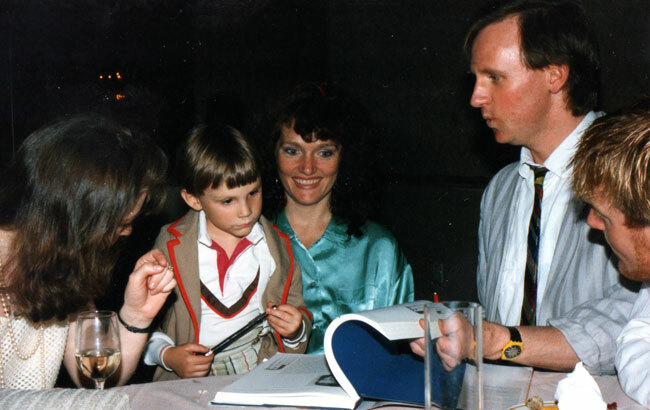 She quickly rallied and followed to the front, to find pre-schooler Gabe sitting in the laps of the show's gracious stars — who were now ignoring everyone else in the queue and happily engaging him and signing his book. He showed them the tire-pressure gauge that he was carrying as The Doctor's 'sonic screwdriver'. A neighbor kindly snapped the color photo above when he recognized the children. 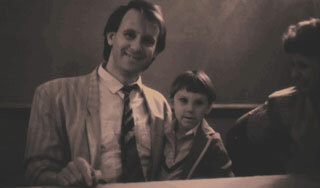 … and Peter Davison ('The Doctor') with Gabe. The TARDIS Interior Making the Translation Matrix The Operations Panel Making the Empathic Circuits Next: the Navigations panel A New Year's Day Party ~ videos!